Our modern world is based on semiconductors. In addition to your computer, cellphones and digital cameras, semiconductors are a critical component of a growing number of devices. Think of the high-efficiency LED lights you are putting in your house, along with everything with a lit display or control circuit: cars, refrigerators, ovens, coffee makers and more. You would be hard-pressed to find a modern device that uses electricity that does not have semiconductor circuits in it. While most people have heard of silicon and Silicon Valley, they do not realize that this is just one example of a whole class of materials. But the workhorse silicon – used in all manner of computers and electronic gadgets – has its technical limits, particularly as engineers look to use electronic devices for producing or processing light. The search for new semiconductors is on. Where will these materials innovations come from? As the name suggests, semiconductors are materials that conduct electricity at some temperatures but not others – unlike most metals, which are conductive at any temperature, and insulators like glass, plastic and stone, which usually don’t conduct electricity. However, this is not their most important trait. When constructed properly, these materials can modify the electricity moving through them, including limiting the directions it flows and amplifying a signal. The combination of these properties is the basis of diodes and transistors which make up all our modern gadgets. These circuit elements perform a multitude of tasks, including converting the electricity from your wall socket to something usable by the devices, and processing information in the form of zeros and ones. Light can also be absorbed into semiconductors and turned into electrical current and voltage. The process works in reverse as well, allowing for the emission of light. Using this property, we make lasers, LED lights, digital cameras and many other devices. While this all seems very modern, the original discoveries of semiconductors date back to the 1830s. By the 1880s, Alexander Graham Bell experimented with using selenium to transmit sound over a beam of light. Selenium was also used to make some of the first solar cells in the 1880s. A key limitation was the inability to purify the elements being used. Tiny impurities – as small as one in a trillion, or 0.0000000001 percent – could fundamentally change the way a semiconductor behaved. As technology evolved to make purer materials, better semiconductors followed. The first semiconducting transistor was made of germanium in 1948, but silicon quickly rose to become the dominant semiconductor material. Silicon is mechanically strong, relatively easy to purify, and has reasonable electrical properties. It is also incredibly abundant: 28.2 percent of the Earth’s crust is silicon. That makes it literally dirt cheap. This almost-perfect semiconductor worked well for making diodes and transistors and still is the basis of almost every computer chip out there. There was one problem: silicon is very inefficient at converting light into an electrical signal, or turning electricity back into light. When the primary use of semiconductors was in computer processors connected by metal wires, this wasn’t much of a problem. But, as we moved toward using semiconductors in solar panels, camera sensors and other light-related applications, this weakness of silicon became a real obstacle to progress. The search for new semiconductors begins on the periodic table of the elements, a portion of which is in the figure at right. In the column labeled IV, each element forms bonds by sharing four of its electrons with four neighbors. The strongest of these “group IV” elements bonds is for carbon (C), forming diamonds. Diamonds are good insulators (and transparent) because carbon holds on to these electrons so tightly. Generally, a diamond would burn before you could force an electrical current through it. The elements at the bottom of the column, tin (Sn) and lead (Pb), are much more metallic. Like most metals, they hold their bonding electrons so loosely that when a small amount of energy is applied the electrons are free to break their bonds and flow through the material. Silicon (Si) and germanium (Ge) are in between and accordingly are semiconductors. Due to a quirk in the way both of them are structured, however, they are inefficient at exchanging electricity with light. To find materials that work well with light, we have to step to either side of the group IV column. Combining elements from the “group III” and “group V” columns results in materials with semiconducting properties. 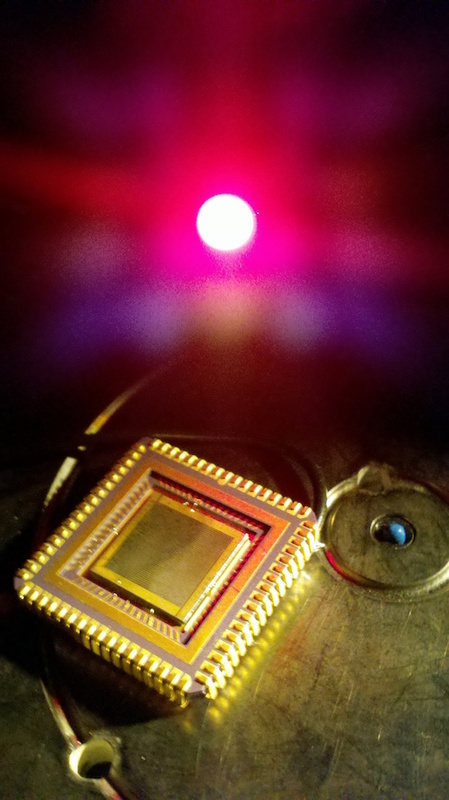 These “III-V” materials, such as gallium arsenide (GaAs), are used to make lasers, LED lights, photodetectors (as found in cameras) and many other devices. They do what silicon does not do well. But why is silicon used for solar panels if it is so bad at converting the light into electricity? Cost. Silicon could be refined from a shovel full of dirt scooped up from anywhere on the Earth’s surface; the III-V compounds’ constituent elements are far rarer. A standard silicon solar panel converts the sunlight with an efficiency of 10 to 15%. A III-V panel can be three times as efficient, but often costs more than three times as much. The III-V materials are also more brittle than silicon, making them hard to work with in wide panels. However, the III-V materials’ increased electron speeds enable construction of much faster transistors, with speeds hundreds of times faster than the ones you find in your computers. They may pave the way for wires inside computers to be replaced with beams of light, significantly improving the speed of data flow. In addition to III-V materials, there are also II-VI materials in use. These materials include some of the sulfides and oxides researched in the 1800s. Combinations of zinc, cadmium, and mercury with tellurium have been used to create infrared cameras as well as solar cells from companies such as First Solar. These materials are notoriously brittle and very challenging to fabricate. High power III-V (gallium-nitride) semiconductor electronics will be the backbone of our electrical grid system, converting power for high voltage transmission and back again. New III-V materials (antimonides and bismuthides) are leading the way for infrared sensing for medical, military, other civilian uses, as well new telecommunication possibilities. Earth-abundant element combinations are being explored to make new semiconductors for high-efficiency, but inexpensive, solar cells. And what of the old standby, silicon? Its inability to harness light efficiently does not mean that it is destined for the dust bin of history. Researchers are giving new life to silicon, creating “silicon photonics” to better handle light, rather than just shuttling electrons. One method is the inclusion of small amounts of another group IV element, tin, into silicon or germanium. That changes their properties, allowing them to absorb and emit light more efficiently. Thomas Vandervelde is an Associate Professor of Electrical and Computer Engineering, Tufts University. This article was originally published on The Conversation. Read the original article.